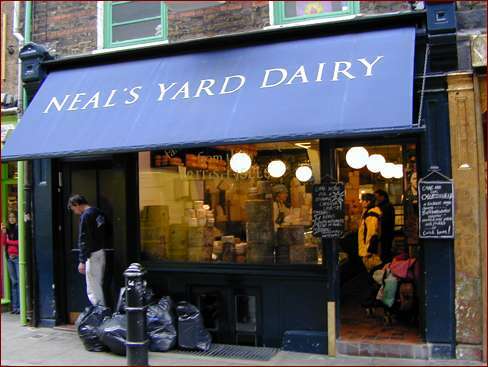 Neal's Yard Dairy isn't the biggest cheese shop I've ever visited, nor the one with the greatest variety of cheeses from around the world. 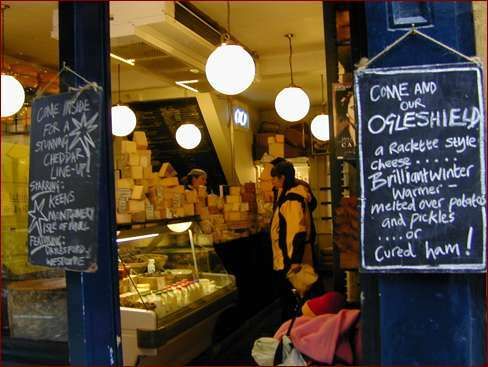 No, Neal's Yard Dairy has the most amazing selection of artisan cheeses from around the United Kingdom. If there's a gentleman, or a gentlewoman, farmer who makes some specialty cheese with a small herd in a remote location, you'll find it here. Tiny quantities, from family farms, delicious beyond belief. Like I said, the best damned cheese shop in the whole wide world. The staff wield small knives, with which they slice samples from the wheels and pies of cheese piled high around the shop. Just like Wallace P. Flynn (from The Man Who Loved Cheese by Garrison Keillor), we choose cheese. Full of samples, with a small bag of cheese hanging from the pram, we next pass through the shopping mecca of Seven Dials.